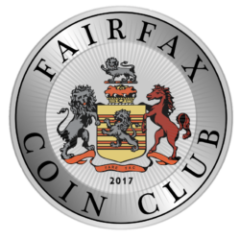 Welcome to the Fairfax Coin Club - We are now 80+ Members Strong!!! Our next meeting is Tuesday, May 14th!!! The Fairfax Coin Club is looking to attract new members, both beginners and experienced, to join and share their knowledge in their favorite coin collecting specialities. The Fairfax Coin Club meets regularly the second Tuesday of the month at the Vienna Community Center located at 120 Cherry St SE, Vienna, VA 22180. There is plenty of FREE parking. 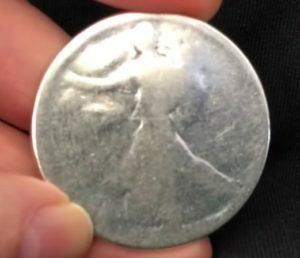 Extremely worn coins have always been of much interest to me as a collector. There is always something about them that makes you wonder, how did this coin get so worn down? How many hands has this coin passed through? Who has held this coin before? There is also the fun of figuring out what the coin is in the first place. My favorite types of extremely worn coins are ones that are extremely low grade, the date is still legible, and the coin is problem free. 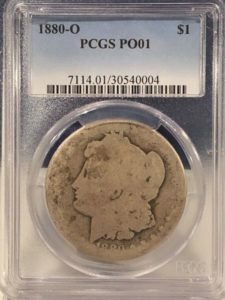 One day I would like to get my hands on a PCGS graded poor-01 Morgan Dollar, but these are quite expensive due to the fact that many people collect them. They bring in a heavy premium over good-04 or very good-08 coins. In the photo above is a Silver Eagle from 1990. The owner of the coin bought it in uncirculated condition from the mint, and has carried it in his pocket almost everyday since, for almost three decades. This has caused the most wear I have ever seen on an American Silver Eagle. Now, it’s time for the coins that are actually in my collection. The first one is a shield nickel. Shield nickels were made starting in 1866, and production ended in 1883 with the rough release of the 1883 no cents v-nickel. There are two varieties of the shield nickel, the variety with rays in between the stars, made in 1866 and part of 1867, and the shield nickel with no rays, made starting in 1867 until the end of the series in 1883. They had to remove the rays due to difficulties in striking the pieces with full detail. 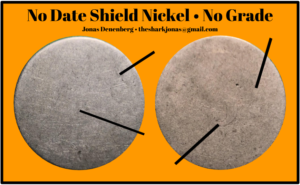 I have had my well worn shield nickel for over two years, but did not realize that it was a shield nickel until about two months ago, and there is an interesting back story as to how I got it. In 2016, we went to my grandparent’s house on Long Island for my birthday. When we got there, my grandfather told me he had an old box of coins that he found in his basement. I think, “oh, cool. Maybe he’ll have some wheat pennies to help me fill up the little folder I have”. (At this time, the only coins I collected were out of circulation using the Whitman folders. I didn’t care much for the hobby though, and had never even heard of the Redbook). In the box was a two cent coin, a large cent, some Indian Heads, some more American coins, and a bunch of smaller boxes filled with world coins. I immediately thought: “these are the coolest coins ever!” and asked if I could have the two cent coin. Well, he gave me the entire box! This is what sparked my interest in rarer coins (ones that you can’t find in circulation). It turns out that every coin in the box was pulled out of circulation by his dad. I dove straight into the American coins but let the boxes of foreign coins sit there for months. I finally looked at them more closely and discovered a blank coin. I didn’t think much of it and tossed it back in. For the next year or so, it remained a blank coin, and nothing else. That is until about two months ago when I looked at it for the third or fourth, and picked up on a tiny bit of detail. It was part of the number five surrounded by stars. I immediately thought: “I might be on to something!” and looked closely at the coin under my microscope, my magnifier, and, when looking at it under my bare eyes, I was able to make out part of a shield, part of a five, and part of “United States Of America”. Sure enough, I had a secret shield nickel sitting in my collection of foreign coins. I consider it to grade as a poor-01 coin, however, under actual grading standards, it would grade lower than poor-01 and receive no grade at all, due to the fact that the date is unreadable. 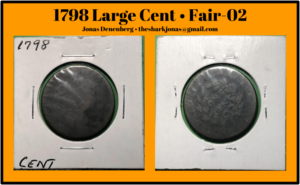 My second well worn coin is a 1798 draped bust large cent purchased from a fellow Fairfax Coin Club member. I would like to be able to say his name, but I am not sure what it is. I paid $7 for the coin, and I am quite happy with my purchase. This is one of two 1700’s US coins that I own, the other being a 1795 half cent. The date on the 1798 large cent is barely legible, but able to be read under the right light. There is minor corrosion, but not much. On this coin, I truly wonder where it has been and how long it circulated, considering the amount of wear. It is actually my second draped bust large cent, as I have an AG-03 1802 currently sitting in my type set album. Anyhow, it’s now time for a history lesson on large cents. Large cents were produced at the U.S. Mint from 1793 to 1857, and then again as a pattern in 1868 by idiots at the mint who wanted to create a “rarity for collectors”. There are many different types of large cents, and mine in particular is part of the draped bust type (as I already mentioned), minted from 1796 to 1807, for 11 years. They were designed by Robert Scott. Draped bust cents are plentiful in grades G-F, but MS coins are very scarce and most have brown surfaces. When it comes to striking, many coins in the series are lightly struck on the dentils. For higher grade specimens, you also want to make sure there is a good strike on the leaves and hair. When it comes to planchet quality, you want to watch out for rough and porous planchets. Moving back to specifically the 1798, over 1.84 million coins were struck in total, with four different major varieties. Dozens or possibly even hundreds of smaller varieties exist, though I am yet to look into these. When it comes to grading, my 1798 coin would receive a grade of around fair-02. The grade on the reverse happens to be slightly higher than the grade on the obverse, but there is not much difference. Looking at color grading, this is obvious, it receives a BN (or a Brown) grade. Hopefully you enjoyed these two well worn coins of the month. The photos above of the shield nickel and the large cent are of the actual coins I wrote about and were taken by me. The photos of the Silver Eagle and the Morgan Dollar were taken by other people, listed below in the credits. If you want to take a crack at writing your own article, I recommend you write one and email it to Jason! His email address is somewhere on this website, I believe at the bottom of the homepage. Jonas Denenberg is a Numismatic blogger and video producer. You can follow him online on Youtube or his ANA blog.